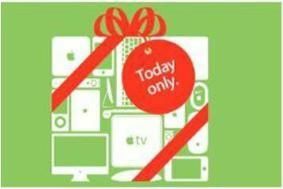 Apple store offers one-day discount deals | What Hi-Fi? And if you want an Apple TV you'll save £11 – the 160GB version is £207.99 just for today. Other discounts include £35.95 off the Altec Lansing inMotion MAX iPod dock, now £114, £21.95 off the Klipsch Image S4i in-ear headphones with microphone, down to £68, and a saving of £31.95 on the Monster Beats Studio headphones by Dr Dre, now £248. Small items get the biggest percentage cuts. There's 29% off the Nike + iPod Sensor, now £9.99, or a whopping 36% off iWork, which now scans the tills at £44.